Grammar tips: Run-ons, comma splices, fused sentences Grammar tips: Run-ons, comma splices, fused sentences - HGR Inc.
For instance: They shopped in Aisle 1 and filled their cart, they paid the salesperson immediately. 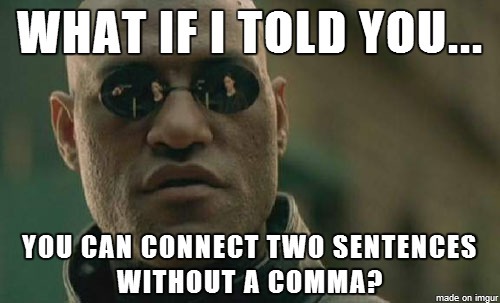 Two independent sentences were “spliced” incorrectly with a comma. There are three ways to correctly punctuate this sentence. You can separate them with a period and make them independent sentences: They shopped in Aisle 1 and filled their cart. They paid the salesperson immediately. You can make them into a compound sentence by using a comma and a coordinating conjunction (and, but, for, or, nor, so, yet): They shopped in Aisle 1 and filled their cart, and they paid the salesperson immediately. You can use a semicolon with a connecting word other than one of the coordinating conjunctions, or you can use a semicolon if you do not have a connecting word (notice that the previous sentence is a compound sentence punctuated correctly using a coordinating conjunction and a comma): They shopped in Aisle 1 and filled their cart; then, they paid the salesperson immediately. OR They shopped in Aisle 1 and filled their cart; they paid the salesperson immediately. For fun and practice, you can take a little quiz here, courtesy of Capital Community College. How did you do?